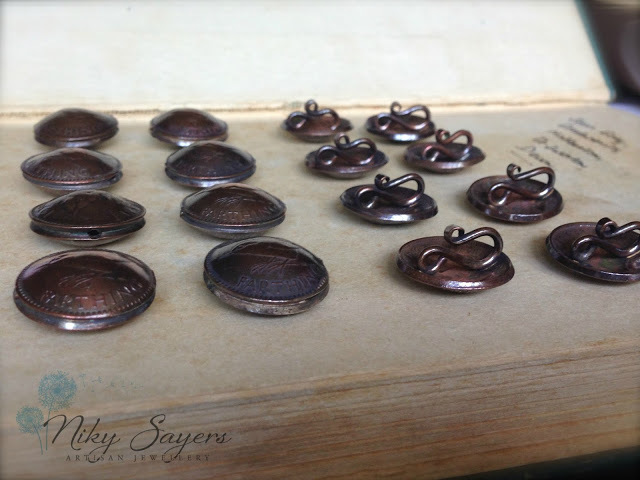 This month, the Component of the Month for the Art Jewelry Elements team was by Niky Sayers - she sent us fun farthing clasps! I love her work - you can find her jewelry etsy store here - and her coponent store here - and was thrilled with the clasp. As usual, I forgot to take a photo of it on it's own before I started making something, so here's Niky's photo! And here's the one I received! When I received it in the mail, I knew I wanted to make the clasp the centerpiece, and wanted to have a multi-strand bracelet. 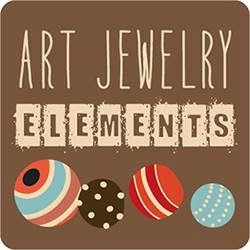 I immediately thought of making many strands of seed beads and went to work looking on etsy for some beads that appealed to me. I finally settled on the set here - they are called Olive Picasso Travertine and I purchased them from Beachartz on etsy. I need to make a better "eye" for the hook, so if anyone has some ideas I'm all for them. I don't like how you can see it when the bracelet is closed. I also have other ideas now, and may just take this apart and use some of my favorite gemstones instead of multi-strand seed beads. But that will be for another day! Please check out what everyone else made this month! And thanks for stopping by! Sue, I really love what you made, I wanted to make a multi strand bracelet at first too but have no idea how to use beading wire and crips etc and the thought of wire wrapping a gazilion beads did not appeal to me. The colours are amazing really bright and zingy and It really dose make the clasp a focal point! Thank you so much for joining in, I have really enjoyed seeing what you have created! I do love your color choices and admire your ability to make wire work for you. I love your bracelet just the way it is. Wonderful colours and the design really highlights Niky's clasp.What fun this is! Pretty! I love the colors and how the clasp really sets them off. Excellent Job. Those beads are lovely, they bring out the colour of the coin beautifully, it's a gorgeous design! Oooo, I love those beads with the copper coin! Great choice. You could go for crimp covers or pull all the ends into an antiqued copper end cone. I like it. It reminds me of Indian Corn... and that's a good association to me. Fall, leaves, harvest, birds over head.... Really pretty, Sue! Very pretty - love the colors and the little beads.